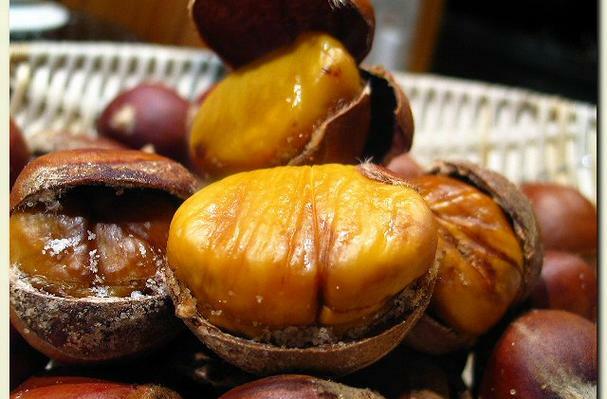 Using a small sharp knife, carefully score chestnuts by making a single, 1/8-inch deep slit across the center on the rounded side of the nut, to keep them from exploding during cooking. Rinse and soak in the water for 10 minutes. Drain. Place the pan filled with salt and drained chestnuts on medium heat. Stir fry the chestnuts until the salt has turn lightly browned, drizzle the sugar syrup over while keep stirring. Continue stirring until the shells open up and look dark brown. Chestnuts offer high fiber, mineral and cholesterol-free benefits of tree nuts, without the calories and fat content. And they are gluten free! They also are the only nut that contains a significant amount of vitamin C. Like all plant foods, chestnuts contain no cholesterol. So why not "go nuts"?